KIM LAWTON, anchor: Interfaith marriage has become commonplace in this country. But, for a long time, when it came to the wedding ceremony, many couples felt they had to pick just one religious tradition, the bride’s or the groom’s — or none at all. Today, brides and grooms are finding new ways to incorporate both their religions. Betty Rollin has our story. SANJANA PURSNANI (Makeup Director, Sona Salon): When it dries up and it starts flaking it gives you that mahogany, like a red burgundy color. So in India the bridal colors are red. We usually wear red, maroon, burgundy, so they say that the bride’s hand shouldn’t show color of her skin. ROLLIN: Sunitha met her husband-to-be, Ronjit Sandhu, who is a Sikh, at college eight years ago. SUNITHA MANI (Bride): The henna artists told me yesterday the darker the henna the more your husband and your in-laws love you, so my hands are dark, but not down here so much. ROLLIN: The groom’s mandate on the wedding night is to find his name hidden in the design. RONJIT SANDHU (Groom): The night of the wedding, I’m supposed to find — I’m supposed to search for my name in the henna, and then if I can’t find it, basically I’m not allowed to consummate our marriage. ROLLIN: The next pre-marriage ritual performed is the puja, where the bride’s family’s Hindu pandit prays before a sacred fire. Pandit BALU DIXIT (Hindu Temple, Albany, NY): We pray to Lord Ganesha asking for his blessings, so that everything goes very smoothly without any obstacles. ROLLIN: When Sunitha’s parents married, not only were they required to be of the same faith, but they were expected to marry the person their parents chose. 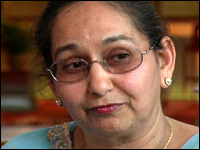 KANTHI MANI (Mother of Bride): We got married, what, 36 years ago. I think it was through communication between my parents and his parents, and they looked at the horoscope, and once it was agreed, he came to visit me, and that’s it. I hardly knew him until I got married. ROLLIN: And how do the Manis feel about their daughter marrying outside their faith? Dr. SRINIVASAN MANI (Father of Bride): Whatever makes our daughter happy and secure in the future, that’s what matters, rather than our discomfort. ROLLIN: The groom’s father, now a widower, and his aunt also have had some concerns. SURJIT SINGH SANDHU (Father of Groom): Not having the same culture and the language, sometimes it’s hard to interact. 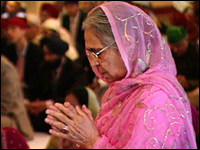 SATWANT KAUR BANGA (Aunt of Groom): I think that as soon as you hear of a child marrying into a different religion, even though Sikhism absolutely tells there’s only one God and all people are equal, the cultural differences — they creep in after the children come in. Mr. S. SANDHU: Ideally, you know, you want your kids to be raised as Sikhs, but then again once you are out of India, you know, our kids now are raised in this culture. So in this culture, their culture is the same. ROLLIN: Ronjit has his own ideas about what his childrens’ religion will be. Mr. R. SANDHU: I think they’ll definitely be raised under both religions. You know, they are going to go to temple, they are going to go to gurdwara, the Sikh version of a temple. They will essentially learn, you know, about the histories behind both of the religions. Her parents are very religious, so whether we wanted them or not, they will probably share everything they know. They share it with me openly, so I’m sure they will definitely do it with our grandkids. ROLLIN: The couple decided there was one obvious way to smooth over the religious differences: two weddings — one Sikh, one Hindu. The Sikh wedding came first, with the groom making his entrance on a white horse named Max. The procession is called a “baraat.” The bride’s extended Hindu family awaits his arrival. The families greet each other with an elaborate garland exchange. And here comes the bride. And three hours later, here comes the bride again. Two weddings — one in Sanskrit, one in Punjabi. Countless rituals; two receptions; decorations involving hundreds of yards of fabric; banquets; music of two cultures; 400 guests and a costumed horse. Putting this together takes a commander-in-chief, otherwise known as a wedding planner. That would be Sonal Shah and her small army of lieutenants. SONAL SHAH (Interfaith Wedding Planner, Save the Date Event Consultants): Don’t forget to tell everyone to take their shoes off, cover their head. When she began her profession one religion was the norm. Not anymore. Ms. SHAH: In the last five years since I started doing wedding planning, interfaith marriages have just skyrocketed. Out of the 25 or 30 weddings we do in a year, right now about half of them, if not more than half, are interfaith marriages. One of the biggest problems that we face is the whole meat/non-meat issue. So, you know, we did a wedding last year where the groom was Irish and the bride was Gradrati Indian, and her family, you know, strict Jains — no meat, no potatoes. And his side of the family is Irish, so obviously they want those things. We really just try to come to a consensus. (to Ms. Shah): What did you do? Ms. SHAH: We ended up going with the non-meat. But obviously they weren’t happy about it because their guest list consisted of everybody that, you know, ate meat and potatoes! ROLLIN: At the Mani-Sandhu wedding there was also a meat issue, since Hindus are vegetarians, but meat won out. And then there is the animal issue. 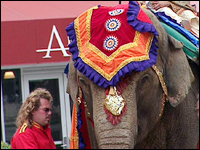 At a recent wedding Sonal supervised in Washington, D.C., a Hindu groom wanted to make his entrance on an elephant. Ms. SHAH: It definitely posed a lot of challenges. But, yes, we found an elephant. We had the elephant brought over on a semi to downtown Washington, D.C. on Pennsylvania Avenue. So it was very exciting. But it was, literally — the last six months of the wedding all we were worried about was this elephant. ROLLIN: Back at the Mani-Sandhu wedding, Sonal has made sure that the two weddings faithfully represent the two religions. At the Sikh wedding, men and women sit separately on the floor — shoes off, heads covered. The service centers around the Sikh holy book, the Guru Granth Sahib. Ms. BANGA: The bride and the groom, they go around the guru, keeping in mind that the guru or God is the center. All their life, because of this way, they will be very easily able to mend their differences if that’s what they keep in mind. ROLLIN: At the Hindu wedding the bride groom also do a walk-around. Pandit DIXIT: So that completion of the seven rounds around the fire signifies that they are married, and that concludes with the ceremony where the groom offers a necklace, ties a necklace to the bride and usually they put a little dot, like a kumkum, a sindur of the forehead of the bride, and that means she’s a married woman from then on. ROLLIN: At the end of the Hindu service, the Sikh elders were invited to join in blessing the bride and groom, showering them with rice, flowers, and spices for fertility, happiness, and peace. 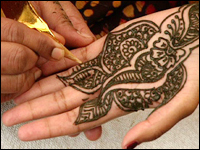 The bride’s hands are painted with henna. Mr. S. SANDHU: As long as, you know, they will respect each other, not only as an individual but also respect each other’s customs and religion, you know — let the kids learn the better of both sides, and I think they will be stronger. ROLLIN (to Mr. S. Sandhu): Did it take you awhile to come to this? Mr. S. SANDHU: Yes. You know, your initial reaction is, you know, you would rather have things, you know, go your way, let it be simple. But reality is not always simple. ROLLIN: This three-day celebration does come to an end, and Ronjit and Sunitha will be off to Hawaii for their honeymoon, knowing that they have the blessings and acceptance of both families. For RELIGION & ETHICS NEWSWEEKLY, I’m Betty Rollin in Utica, New York. 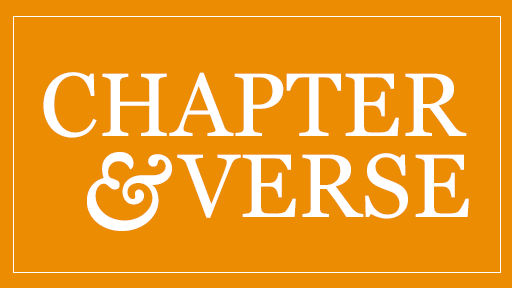 Peabody Essex Museum: "Wedded Bliss: The Marriage of Art and Ceremony"